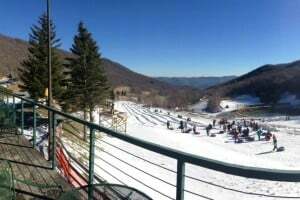 The snow tubing photo above is taken at Wintergreen Resort in Virginia and they—along with Winterplace’s tubing and Wisp Resort’s in Maryland—rank as the best of the best from around the region. If you get a chance to visit one of these resorts, be sure to check out their well-groomed, near perfect tubing hills! 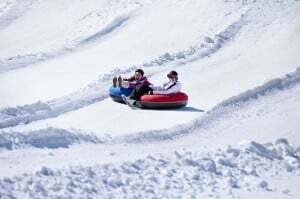 Although we rank these as the top three tubing hills, many of the Southeast’s and Mid-Atlantic’s ski areas now offer snow tubing. Some resorts are more restrictive than others about riding together, minimum ages and hooking tubes together, etc. So we have provided some links to all of the resorts’ tubing information. We hope that you’ll give it a try for yourself! 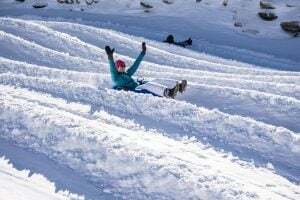 Although skiing and boarding are the main reasons people visit the slopes, there’s no question that snow tubing has been a great addition to the winter fun at all of the region’s ski resorts. 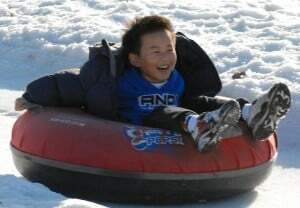 Snow Tubing has become a favorite alternative winter activity for a lot of people and particularly families and groups. We receive a lot of emails from families and friends that are planning trips and want to know if there are any activities that those who DON’T ski can participate in while others in the group are carving up the slopes. TUBING is a great answer! 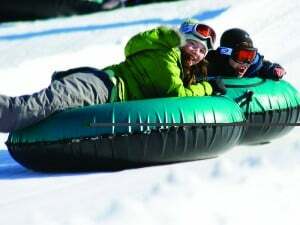 You’ll love snow tubing at Bryce Resort’s new Ridge Runner’s Tubing Park. No special skills are needed to enjoy the thrill of sliding down one of our 800-foot long tubing lanes. Our new carpet lift will quickly take you back up for another ride! Tubing Policy: One person per tube. Children must be 4 1/2 years old and at least 42″ tall. 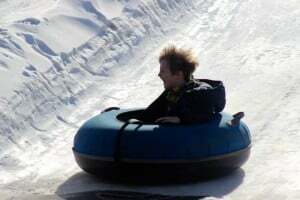 One of the most popular places at the resort is the Tube Park, where guests grab specially designed riding tubes and head down 600-foot lanes. A handle tow pulls you to the top of the hill. And don’t think this “sport” is just for kids: it’s great for eight- to 80-year-olds. Must be age 4 or older and meet 42″ height requirement. Limited space available per 2 hour session time. The 5 run snow tube park is sure to be a must for visitors and locals alike. Sit back and enjoy the moving carpet lift to the top and then get ready for the slide of your life. You must be 42″ tall to ride. 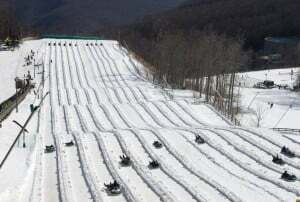 Hawksnest’s expanded snow tubing operation will make it the biggest snow tubing operation on the East Coast. Our Snow Tubing resort will now have 4 different areas to snow tube with 20 lanes of fun, lanes will be 400 – 1000 feet long and 2 moving carpet lifts to take you back to the top. Remember the fun of sledding? Now enjoy all the fun of sledding without all the work of walking back up the hill! Our snow tubing area offers 2 lanes of tubing excitement. Available mid-December through March, weather and natural snowfall permitting. Peaked Mountain Express Tube Park is a thrilling 900-foot-long hill! Ride down and then let our SunKid Wonder Carpet take you back to the top. Weather and track conditions permitting, we do allow “training” or “chaining” of tubes at our discretion. Children must be at least 36″ tall to tube. One person – one tube, no exceptions. 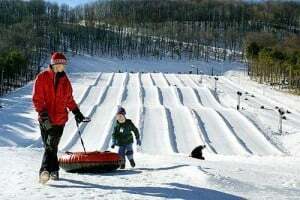 Jonas Ridge Snow Tubing Park is devoted solely to snow tubing, an activity that is becoming more and more popular each year. A great way for the whole family to enjoy the snow together, Jonas Ridge has a reputation for safety and offers night tubing, a lift, and even has snowmaking capabilities. One person per tube. Children ages 4 to 6 must be supervised by an adult and are only allowed to ski during the daytime; those under the age of 18 are required to have a parent or guardian sign a release form. Groups of 15 or more should call ahead. New this season is Ober’s Snow Tubing Park with 9 great 400-foot lanes and a 50-foot vertical drop. There are no special skills or equipment required—just a sense of adventure! Must be at least 6 years old and 42″ tall to ride solo; children ages 3 – 5 must ride with an adult; children under 3 are not permitted to ride. 700 feet of frozen fun with a 60-foot vertical drop! Got the need for speed? Grab your inner tube and ride the magic carpet lift to the top. If you have never been tubing, it is a must-do activity. The tradition began in the Alps, and the Scaly Mountain Tubing in NC rendition is an experience all its own. Come enjoy this wild and crazy ride for yourself. Laughter fills the air as you slide down the 6-story tubing hill at the Tube Park at the Silver Creek area. Cost: $17 for a two-hour tubing ticket. All tubing participants must be at least 36″ tall and at least 4 years of age. Guests must have footwear other than ski boots. Ski boots are not allowed while riding snow tubes. Their 700-foot tubing run has its own lifts, snowmaking, lights for night tubing and is groomed regularly. 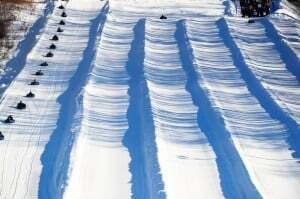 The “Tubing” area is approximately 700 feet long and consists of several “chutes” 10 to 12 feet wide. The tubing area is serviced by a moving conveyor lift which transport riders smoothly to the top of the runs. Must be 3 years of age or older to tube. Children 6 and under must ride/share a tube with an adult. 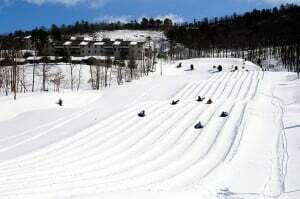 Ride the largest Snow Tubing Park in West Virginia and perhaps the largest overall in the Southeast and Mid-Atlantic! Sixteen lanes with 2 Super Carpet lifts! The best part is the 2 Super Carpet lifts whisk you back up the hill to do it all over again! Height requirement for children is 44″ or taller. Each lane is 750 feet. long. 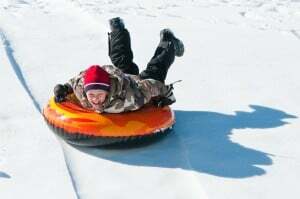 Private tubes are not permitted in the tubing park. Groups of 25 or more may qualify for discounts, contact our Group Sales Department. In compliance with State of Maryland regulations, children must be at least 42″ tall in order to participate. The Plunge! 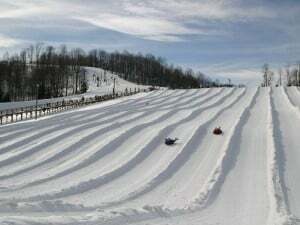 is Virginia’s largest tubing park. Imagine being on top of a ten-story building and looking out over a hill that’s longer than three football fields (900+ feet)! Now imagine going downhill on a tube at speeds reaching 30 mph. That’s The Plunge! Our conveyor lift will bring you and your tube comfortably and quickly back up the hill so you can do it again. Ages 6 and up. You must be 42″ or taller to ride The Plunge! One person per tube, but you may “hook” tubes together.